Discussion in 'Build & Tune' started by GlassKnees, Nov 2, 2018. I had two flying video platforms that were similarly equipped though different frames - one was a modified Parallax Elev-8 and the other was a Tarot 650 Sport. 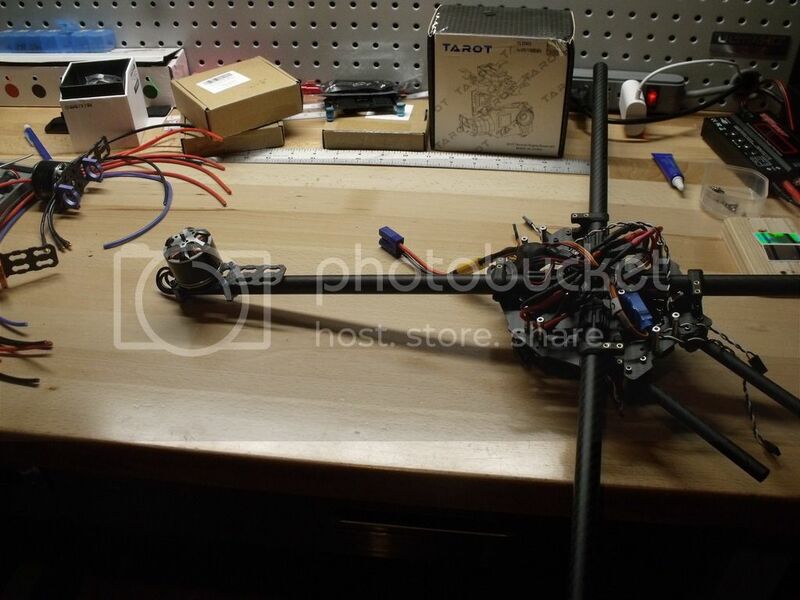 Both had T-Motor Navigator MN3520 400KV motors, 15.5"props and Hobbywing Platinum Pro 30A OPTO Escs. Both had APM 2.6 flight controllers. The Elev-8 fell out of the sky as I was hovering between my house and my neighbor's. It just became unstable and fell - no idea what the cause was. The Tarot crashed in a similar manner. I did notice that one or more motors did not seem to run steadily - varying pitch seemed to indicate revving. I tried calibrating the ESC's but did not solve the problem. Later, while flying a waypoint mission, it too suddenly fell out of the sky and crashed in a field - total loss. Flight endurance: 20 minutes or so. I don't need collision avoidance as I plan to fly in open fields and will keep the aircraft in visual sight. I don't want to spend over $900 for an aircraft and would like to use parts I recovered. T-Motor MN3520 motors. I have three working motors and bought one on Ebay for $37 from a hobby shop that had one and wanted to get rid of it (retails for around $100). Based on previous experience I expect the aircraft weight sans lipo to be around 2 KG but I'm hoping to get as close to 2.0 as I can. Based on T-Motor performance specs, I am hoping for around 18 - 19 min. endurance using a 12000 mAH lipo, but I live in Colorado at 4K feet elevation, so I won't know what my max endurance is until I test it out. The build is proceeding slowly as I have been waiting for stuff to arrive in the mail. I'm still waiting for 3.5mm bullets in order to fabricate the wires that go from the ESCs to the motors. In the meantime, I've been hooking together the power distribution harness, ESCs and a Castle BEC that I need to power the receiver (the ESCs are OPTO). I intend to install a T4-3D gimbal and a 600 mW video transmitter once I have built and flight tested the aircraft. The APM will get it's power from the APM power module and I will plug the BEC into an unused channel port to the receiver in order to power it. I am thinking of using a separate 3S lipo to power the gimbal and video transmitter, but am wondering if I can power the gimbal and video transmitter when I plug the servo connector from the receiver to the tilt control port on the gimbal - I will use ch6 for gimbal tilt conrol. Do I risk receiver brownout if I try to tap power for the gimbal/video transmitter from the R/C receiver? I'm thinking that it's safer to use a separate power source for the gimbal/transmitter.... Any thoughts? ringolong and Dugdog47 like this. I am in a holding pattern waiting on 3.5 mm banana bullet connectors - I need them to fabricate the leads that go from the ESCs to the motors. The local hobby shop doesn't have any in stock so I ordered a package from Amazon, but it won't arrive until early-mid December... rats! In the meantime, my Spektrum 8 ch receiver arrived and since I had completed the power distribution set up, including installing the Castle BEC, I thought I'd try it out. So I plugged the BEC servo connector to an unused channel on the receiver and plugged in a 4S lipo to the aircraft. The receiver lit up and I was able to bind it to my transmitter. Next, I plugged in a spare ESC that has three leads for the motor and plugged it into the wiring harness and plugged in one of the T-Motors. I plugged the ESC servo connector to the throttlel port and was able to spin the motor when I advanced the throttle. While scavenging through my pile-o-parts, I came across a 600 mW video transmitter, salvaged from the Elev-8 crash. I believe that it is undamaged and usable. I also found a cable for it that plugs into ports for video, audio signals. I will use single servo connectors to plug into the power and ground - will test the video transmitter to make sure that it is working okay. I also retrieved a pair of solid nylon rods that I used on the Elev-8; they are stronger than the carbon tubes for landing skids that tend to break on a rough landing. I also salvaged the GPS/compass module and mount from the crashed Tarot 650 Sport, but I'm leery about using it. It appears to be undamaged, but I know from a experience that a bad GPS/compass can cause a flyawayso I don't want to take the risk. A new unit should arrive in a couple of days along with the propellers (17" foldable props). Once have the bullet connectors, the build should go quickly. The last item to arrive will be the Tarot gimbal but that's okay - I won't install it until I've completed a series of test flights. I have good news - I found a local source for some bullet connectors yesterday and also my Tarot gimbal arrived as well! So I am proceeding with the build. the first thing I did today was mount all motors on the Tarot motor mounts, securing them with screws and Locktite. Then, I mounted the new T-Motor on one of the booms and ran the ESC wires through to see if they are long enough to reach the ESC module I built - they are! in fact, they are a tad too long but I made it work. I had cut the ESC leads on the other three motors (the motors I salvaged from the crash), because I installed the ESCs underneath, so I have to fabricate leads to go from the motors to the ESCs. I measured one of the ESC wires on the new motor and cut wires for the other motors but made them one inch shorter. Tomorrow, I will solder bullet connectors on the wires, run them through the booms and install the motors and plug them into the ESC module. Sounds like me when I'm in the soldering area. You should post some pics of the bullet connections after their soldered, I was thinking about doing something similar in a 450 build. 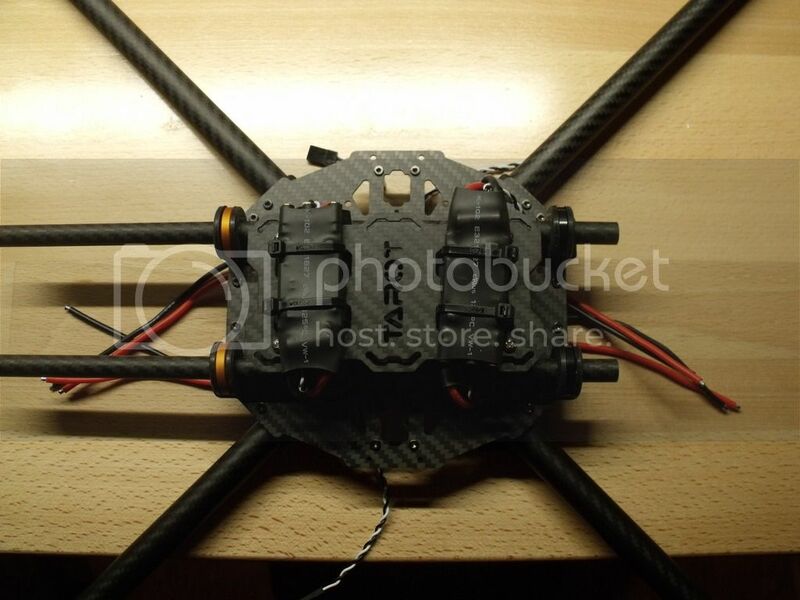 If you build a Tarot quad or hex copter, do not mount the ESC's under the motors without adding capacitors to protect from high voltage spikes due to the ESC switching action. Mount them as close to the power distribution section as possible. 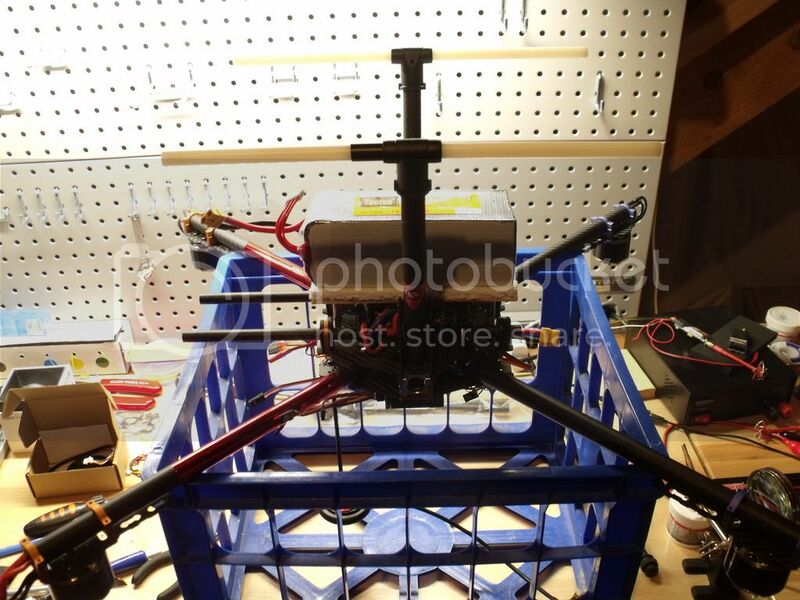 Given the limited space within the chassis, you will need to be creative where to place the ESCs. Just a quick note. I'm on hold again, awaiting delivery of the GPS/compass module and foldable mast that I ordered - it will arrive on Thursday. I need to mount it to the top chassis plate before I button up the chassis. Meanwhile, the propellers should also arrive sometime this week. I also found a smoking deal on Ebay on a 10,000 mAH 6S lipo, and it will arrive on Dec. 4th. Auto Tune - let the flight controller determine the optimum pitch and roll pids by doing a series of pitch and roll movements, iterating on the pid values. Ground Station Failsafe - I've never tried this before because its scary.... fly the aircraft and turn off the transmitter and confirm that the autopilot will take over and return to the launch site and land (RTL). This morning was bitterly cold - 19 degrees F. but it warmed up later in the morning. The air was pretty calm so I took my Elev-8 out for the autotune test as well as test the ground station fail safe feature. Initially I had trouble arming the motors and I had to go back home and troubleshoot. It took an hour or so to fix the problem, put the props back on and head back out to the field. First up was autotune. It went just as I expected it would after seeing several YouTube videos. My aircraft tended to drift off to the right and I found myself having to interrupt it and bring it back to where I was and let it continue. I had a moment of excitement while it was doing the pitch pids - it drifted to the right and as I tried to bring it back it seemed to accelerate to the right some more. It took me a second or two get the correct stick inputs to bring the aircraft back but I did, and after a brief bit, it settled down and started drifting away. So I brought it back and landed and disarmed it, which caused the APM to save the new pid values. So I have a lot more confidence and will feel better about doing these tests on my new build. Sounds like you got it going on with your quads build bro, way to go. Question-I assume you're using Inav and that's what will auto tune pids? Betaflight probably won't do auto tune pids? I'm sure he's probably running Ardupilot firmware as it's an APM flight controller. You are correct RENOV8R - I'm a Ardupilot bigot as that's where all my experience lies. Dugdog47, The Ardupilot firmware has an autotune feature that permits the aircraft to determine optimal pid values in flight. In order to use this feature, you need a spare R/C channel. 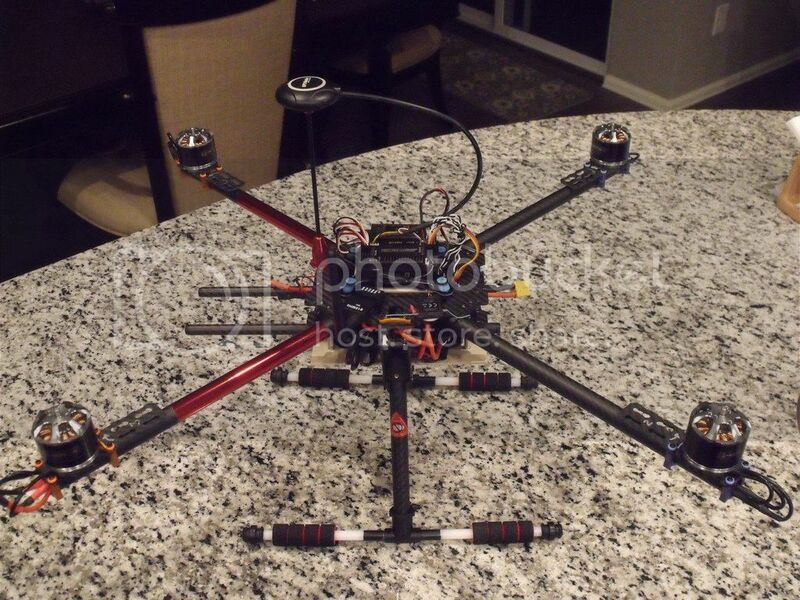 I am using a Spektrum 6 ch receiver and one channel, labeled GEAR (landing gear), is unused. I simplyl plugged that channel into the channel 9 input port on the APM controller and then hooked up the aircraft to Mission Planner on my computer; there, I went to the extended tuning page and selected autotune in the drop down menu for channel 9. After confirming that toggling the GEAR switch on my transmitter causes the signal to change on ch 9 on the Mission Planner Radio Calibration page, I was set to go. All I needed to do was take off, put the aircraft in Alt Hold mode and then flip the Gear switch to activate the autotune function. you can see lots of YouTube videos where this process is documented. After awhile, the quad stopped twitching switched signaled that it was done, and I simply landed the quad and disarmed the motors, causing the APM to save away the new pitch/roll pids. It worked just as advertised. Dugdog47 and RENOV8R like this. So, today, I hit a wall (figuratively speaking). Last night I was looking over my T4-3D gimbal, trying to make sense of the manual (no joy) and figure out the wiring. Searches on YouTube yielded little help - lots of videos showing guys who successfully mounted and operated their gimbals, but little help for me. Although I'm using an APM flight controller, I intend to use the gimbal in Pan Follow mode and connect the tilt control directly to the receiver, bypassing the APM altogether. Anyway, I did come across a video done by a guy in the Netherlands a few years ago (fortunately it was in English! ), and it was a good review, but he warned about placing the gimbal under the propellers as the prop down wash will cause jitter in the video. Crap - I had not considered this! 1. build a "hood" over the gimbal, using a piece of thin basswood to deflect the prop wash. Don't know how effective this would be and I fret that it will adversely affect flight performance. Tomorrow, I will add the foam cushions and rubber caps to the landing skids, removeo the APM and install the firmware and do the IMU configuration, install the telemetry modem, remount the APM and connect everything up. IF all goes well, I might try initial power on to finish the day. Tuesday, if all goes well tomorrow, I will go through all the configurations - compass, radio, ESCs flight modes, fail safes, enable geo fence. Then I will test the motors using Mission Planner via the telemetry link and confirm that all motors run okay and in the proper direction. The APM flight controller is in the middle, the 8 ch receiver on the left and it's slave is the little thing on the right. The telemetry mode is on the right with the rubber ducky antenna. Sticking out the bottom below the GPS mast base are the power and ground leads for the gimbal which I will install after successful flight testing. I discovered a gender mismatch between the aircraft and my new lipo battery pack so I will have to perform a transgender operation on the lipo. I did power up the system using a 4S lipo - no smoke or arcing ;-) But was unablel to calibrate the ESCs - will troubleshoot later today. The glue I used for the foam pad under the aircraft dissolved the foam, so I guess I'll just place the foam on the basswood when I mount the lipo. Propellers won't arrive until next week which will give me plenty of time to complete all configurations, do a motor test and do a power up outside with a telemetry link to my laptop to check preflight parameters and insure I can arm and run the motors. I still have some software parameters to go through and complete the configurations. Then I have to install an EC5 plug on my 6S lipo. After that, I will ldo a series of static tests prior to first flight. Once the test flights are completed successfully I will install the gimbal and video transmitter. Software configurations are complete. I managed to solder on an EC5 plug onto my lipo - powered up the aircraft using it and successfully connected to Mission Planner via the telemetry link. I successfully ran each of the motors using Mission Planner and confirmed that each motor is turning in the correct direction. Next up is to do a preflight check to insure that I can arm the motor and then try a static thrust test; for this, I will remove the 17"props as well as the 15"props from the Elev-8 and put them on the Tarot upside down, so when I throttle up the thrust will push the aircraft down instead of up. I want to make sure that I can reach take off thrust with no problems. If that goes well, I will attempt first flight later today. Short note: ESC calibration failed as well as my attempt to arm the aircraft. Mission Planner offered no clue as to the problem. I suspected something wrong with the ESCs. So I took the aircraft back to the dungeon and removed the top chassis plate to get to the power distribution wiring - tried to calibrate the ESCs individually to no avail. When power is applied, I get three beeps of increasing pitch and that's all. It didn't matter if the transmitter was on or off or what the throttle setting was when I applied power. So, I suspect that application of 6S voltage somehow fried them. 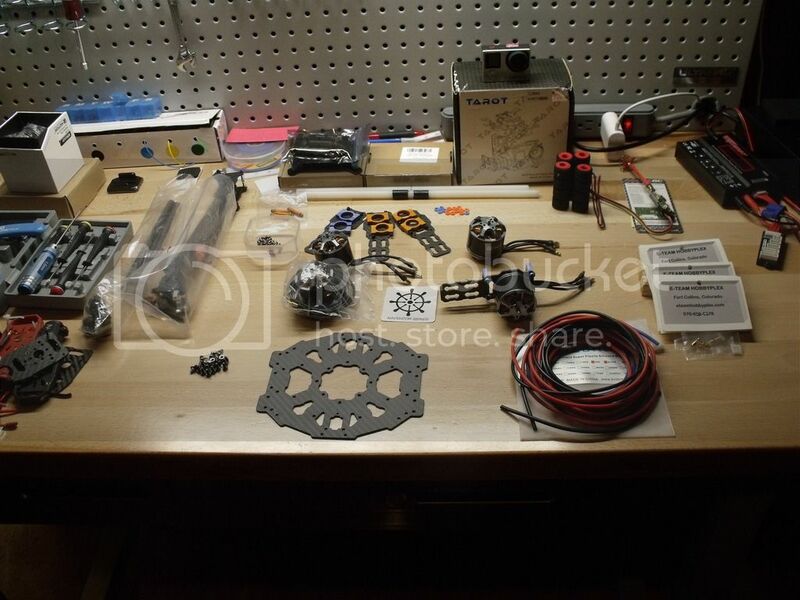 I've ordered four Hobbywing XRotor 40A OPTO Brushless ESCs on Ebay to replace them. It will take at least a week for them to arrive. That may be where your problem lies. One thing this forum taught me about building was to make sure your escs are rated higher than your motors draw. And I don't plan on running at max thrust for continuous periods - in fact, I want to be very sparing on the throttle in order to maximize endurance. At any rate, I only rant the motors once using the motor test in Mission Planner - I had to power the quad using the 6S lipo and connect to Mission Planner using the telemetry modem. I had to raise the thrust to 25% in order to get the motors to run and they ran at low rpm. I was never able to arm and run the motors. I have good news! I solved my arming problem - turns out that the ESCs are okay after all. I successfully calibrated each ESC individually and reinstalled them and put the aircraft back together. I discovered that there's a new feature in Mission Planner called Compass/motor calibration - it is supposed to adjust the compass due to electrical noise from the motors. After I did this calibration I was able to arm and start the motors. I then put on the 15"props from my Elev-8 onto the Tarot upside down in order to generate negative thrust and fired up the aircraft - ran the motors to about 75% power for a couple of minutes and shut down - everything seems to be working fine so I have cleared the Tarot for first flight. As I type this I am charging up the lipo and transmitter.